This made-for-DVD prequel to The Scorpion King directed by Russell Mulcahy (of Resident Evil 3 and Highlander fame) boasts some decent production photography, costumes, special effects, and sets - or at least, they're OK for this sort of thing. The screenplay is however a clunker; predictable and made up of wearisome clichés that will make you roll your eyes. (Sample dialogue: "I've got a bad feeling about this." Yup, they actually pilfered that one straight from the original 1977 Star Wars. And even back then it wasn't exactly fresh either.) Whereas the original Scorpion King wasn't exactly Shakespeare, it at least threw a lot of frenetic action at the audience whenever things got dull. With a smaller budget, this sequel can't quite do the same and the movie becomes a predictable slog with little to do for audiences than check out the beef- and cheesecake on display. No The Rock this time, just a young look-alike Michael Copon doubling for him. The irony-free plot involves Copon's character avenging his father's death at the hands of an evil king with magical powers (played by Randy Couture). Throughout it all we couldn't help but be reminded of that famous line from The Princess Bride: ?Hello. My name is Inigo Montoya. You killed my father . . .? You know the rest. Naturally this involves a quest to find a weapon capable of killing the villain, one which takes the hero and his group of sidekicks on a trip to The Underworld, probably the most original sequence in the film. "You can't stay in the The Underworld for more than an hour without turning into stone," one character who bears an uncanny resemblance to a young Peter O'Toole intones. The same goes for the movie: you can?t watch it for more than an hour without your brain turning to mush . . . THE DISC: As is usual in cases like this, the Making of featurettes included are more interesting than the movie itself. Surprisingly - considering that the external locales mostly consist of a desert landscapes - the movie was filmed in South Africa, Cape Town to be exact. As a native South African we can usually spot South African locales from a mile away, but Scorpion King 2 does an ingenious job at hiding its origins. The only giveaway is the end title credits. The sets, costumes and stunt work are a testament to the South African film industry. With it doubling for a diverse range of locales and the favorable exchange rate it is no surprise that the country is becoming more and more of a destination for low-budget productions. If only the screenplay were of the same caliber . . .
WORTH IT? Not really. 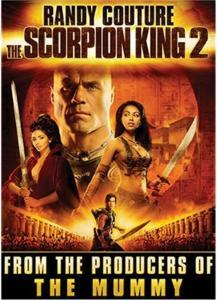 When you think about it The Scorpion King 2 is a sequel to a cash-in on a sequel to a rip-off. No problem with that, except that this Sword & Sorcery affair is so by the numbers that boredom and ennui cannot help but follow. RECOMMENDATION: Wait for it to pop up on the SciFi Channel late one night . . .